Non-toxic, environmentally friendly, odorless heat source using all natural ingredients that are non-combustible. Simply open the outer package and expose the packet to air. No shaking is necessary. 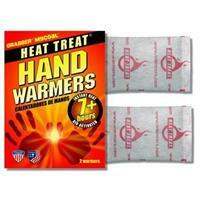 For best results, use Hand Warmers in an enclosed area with air such as a pocket or glove. Avg. temp. 135F (57C), max. temp. 156F (69C) when used as directed. Each package contains 2 Warmers. Inexpensive. Keep hands warm in sub freezing temperatures. Last all day 6-8 hrs. I never ski without them. These keep your hands VERY toasty! Perfect for a cold day on the slopes. 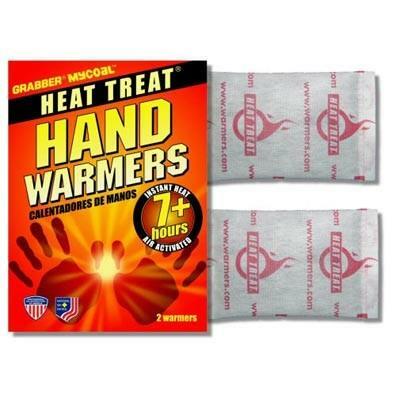 If you get cold hands these are the way to go. I use them in my mittens to keep toast warm. Cons: Takes a while to heat up. I reach for these almost every time I go out. I recommend taking them out of the package on your way up to the mountain because they can take a little while to heat up. Other than that, they last me all day! Once in a while they will get too hot towards the end of the day, but at that point I wouldn't need them as much. My wife loves these for skiing almost every time she goes. I really only need them for the coldest of days, but they definitely work as described and make the cold days more manageable. These warmers are really nice on very cold days, especially the ones made for the soles of ski boots. Not too think to the point it is uncomfortable. Only complaint is they run out quickly and need to be replaced a few times during a full day of skiing. great way to help keep your hands warm. On the slopes, at kids sporting events and those Eagle games!